Earthquake SUB-80X is the market value performance leader. No other sub gives so much bass and punch in this class. Everything superfluous is cut away and all resources concentrated on the most important, namely Bass - hard-hitting, detailed and in massive quantities. Even with its incredibly low price the SUB80 subwoofer is built right. Strong quality components are used all the way through. SUB-80X is a compact and rationally designed subwoofer, which does not compromise on the most important - sound quality. SUB80 have surplus and control even under hard and continuous operation. The impressive performance is complemented by a black ash finish that fits in any interior. 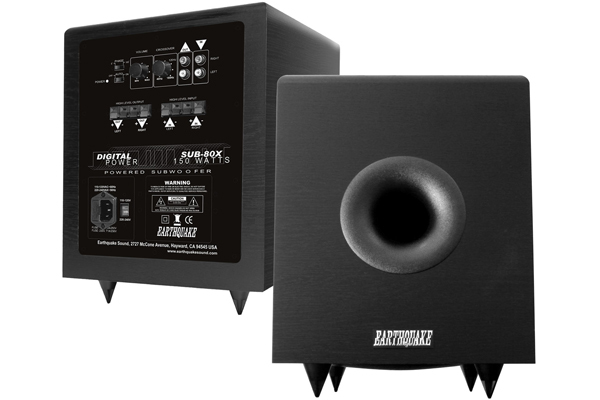 SUB-80X fills the room with accurate musical bass and thundering sound effects. With versatile connectivity options SUB-80X is compatible with all speakers.